The first of two conferences, this one held in 1996 in Dublin (second in 2003 in Derry). Information on the published 1996 proceedings below. Full data also in The Companion to Irish Traditional Music, 2011. Traditional Irish music entered the twentieth century bolstered by the Gaelic Revival and the cultural momentum of the Irish independence movement. The gramophone and radio gave it new life in the 1920s and 1930s, fashioning for it a universal style. But it was in serious decline by World War 2, undermined by modern, popular musics and new consumer values and inferiority complexes. The dance function of the music was becoming redundant too by the 1960s as showbands and discos took over. Paradoxically however, LPs, tape, then CDs became midwives to a successful revival of traditional music, but by the 1990s their potential (allied with artistic questing, favourable political and economic conditions and exposure to other musics) created yet new challenges – synthesisers, video, multiple track recording, digital sound, commodification and PR marketing. The impact of these has nurtured the development of a sophisticated professionalism – manifested internationally most dramatically by Riverdance – and has created an unsettling crisis for the nineteenth-century ideologies of ‘revival’, ‘authenticity’ and ‘tradition’. The Crosbhealach an Cheoil conference in 1996 responded to this by garnering the debate so generated. It drew on the new academia of the Traditional music scene, on its oral-tradition intelligentsia and, in particular, its players. Many of the issues raised in the course of its few days have been dealt with in other ways and in many publications over the three years since, but the topics addressed in the selection of papers presented here remain vitally challenging to all who are interested in Irish music and culture. Some of the essays presented here retain their original form, others have been amended and extended – as is normal practice to compensate for conversion to transmission by print. Mícheál Ó Súilleabháin’s actual paper delivered was, regrettably, unavailable, but has been replaced, at his request, by a study focused on his referenced key player, Tommy Potts. While not the normal practice for a publication of this kind, the editors include it here since not only was he one of the two keynote speakers, but this ‘proceedings’ document would be incomplete if it did not represent his view. And while (like the non-inclusion of some others of the delivered papers) this may deprive the reader of something of the dynamic and historical record of the conference, nevertheless it is our belief that the presentation here of such a specialised case study and associated graphic material complements his argument in the opening session. In any case, it valuably emphasises the observation made on the night by several commentators – that Tommy Potts was summoned by critics and advocates of change alike as simultaneously icon of both ‘tradition’ and ‘innovation’. Publication of these proceedings would not have been possible without the generous support of Milwaukee Irish Fest Foundation, An Chomhairle Ealaíon/The Arts Council of Ireland, The Arts Council of Northern Ireland and the School of Irish Studies Foundation. To these, to Brian Bourke for devising and contributing the conference logo, and above all to the speakers who have permitted their words to appear herein, are extended most sincere thanks. Cormac Breatnach, born in Co. Dublin, is a flute and whistle player, formerly a member of the mould-breaking group Meristem in the late eighties, and then with the jazz-fusion Deiseal. He has played and recorded with in Donal Lunny’s exploratory ensembles, features on an album with Meristem, is lead instrumentalist on Deiseal’s albums, features on both Riverdance and River of Sound albums, and has played for drama, television and film (Moondance, War of the Buttons, Secret of Roan Inish). He has done Irish translation work for IMRO, the Irish Music Rights Organisation, and has a solo album Musical Journey (1999). Liz Doherty is from Buncrana, Co. Donegal. A fiddle player, she lectures in Irish Traditional music at University College Cork. An Honours music graduate of that college, her PhD dissertation from there dealt with Cape Breton Traditional fiddle music. She has played fiddle and recorded with the innovative Cork-based band Nomos, is currently a member of the group Bumblebees, and has a solo recording due for release in August, 1999. She is editor of the complete Capt. Francis O’Neill collection of Irish dance music, due for publication by Ossian in 1999. Colin Hamilton, born in Belfast, and living now in Coolea, Co. Cork, is a flute player and maker, singer, researcher and writer who has pioneered the development of the wooden flute as presently used in Traditional music. An Ethnomusicology MA graduate of Queen’s University, Belfast, he studied under John Blacking. He has a solo album of flute music, and produced in 1990 The Irish Flute Player’s Handbook, an exhaustive treatise on the flute in Irish music. His UCC PhD thesis (1996) is Commercial recordings of Traditional Irish music, he was a visiting Fulbright scholar at UCLA in 1995, has given numerous conference papers, and his book A Social History of Traditional Music in Ireland is due for publication in 2000. Eithne Vallely is a fiddle player and teacher, born in Lifford, Co. Donegal, now living in Armagh. She is an BA graduate of University College Dublin in Celtic Studies, H. Dip. Ed (UCD), and has a Dip. Ed. (Queens, Belfast). Formerly a teacher of Music and Irish in St. Louis’ Convent, Monaghan, she was teacher of Irish in St. Patrick’s CBS in Armagh from 1975-89. From 1989-94 she taught music and was head of Creative Arts in St. Patrick’s College, Armagh. She is a founder member of the teaching-based Armagh Pipers’ Club, has taught instruments with it weekly since 1969, is the author of its fiddle tutor and singing-instruction books, and is joint author of its best-selling tin-whistle tutors. Fintan Vallely is from Co. Armagh and has lived in Dublin since 1968. A writer and musician, he has recorded two flute albums (1985, 1992) and one of satirical song (1988). He is author of the Traditional flute tutor Timber (1986), major contributor to The Blooming Meadows (Townhouse, 1998), editor of Cork University Press’s Companion to Irish Traditional Music (1999). He holds an MA in Ethnomusicology from Queen’s University, Belfast (1993), was The Irish Times‘ Traditional music corr. from 1994-98, writes for music and other journals and has a weekly column with The Sunday Tribune. He lectures in Traditional Irish and International Folk Musics at the National University of Ireland, Maynooth, and at St Patrick’s College, Drumcondra. Participation was invited from ‘within the music, song and dance community in Ireland and abroad, and from academics and specialists in other music fields.’ Responses and opinions from the floor were anticipated. The final list of topics presented covered: 1. Parallel traditions, 2. The song and instrumental traditions, 3. Culture and change, 4. Education-tradition-organisations, 5. Case studies and revival images, 6. Media, tradition and the industry, 7. Tradition and the notion of innovation. Considering the debate generated by an RTÉ tv Late Late Show screening of a ‘special’ on Mícheál Ó Súilleabháin’s River of Sound TV series ? particularly by the opinion of Tony MacMahon that its theme music didn’t sound particularly Irish ? it was decided to invite he and Ó Súilleabháin to present forty-minute keynote addresses on the opening night, to be chaired by singer/writer/publisher Robin Morton. Tony Mac Mahon is an well-known accordion player, an authority on Traditional music and was then a senior producer with RTE television; Mícheál Ó Súilleabháin is a pianist and composer, and is Professor of Music at the University of Limerick. Mícheál Ó Súilleabháin’s theme was ‘Crossroads or Twin Track?’ It raised a series of questions, it looked at change within traditional music and its community, cited the bodhrán and the music of Tommy Potts as case studies of this. It identified a process of change as having begun with the Revival in the 1950s, remarked on Potts’ consideration of some of his playing as ‘experimental’. Ó Súilleabháin held that traditional music could not recreate the music of the past masters because of their different era and mind-set, and he postulated the term ‘trad-pop’ as explication of traditional music’s commercial popularity today. Tony MacMahon noted a superficiality in new-found interest in commercial traditional music. He illustrated in a lengthy audio excerpt from River of Sound what he felt was the remoteness of (in particular Ó Súilleabháin’s) modern interpretation of the music. He introduced the term ‘aural carpet’ as questioning of the quantity of traditional music currently used and received un-artistically in Ireland, saw commercial music’s modern interpretation as ‘scrubbed clean’ of historic voice to appeal to ignorant audiences, holding that technically brilliant younger musicians today often lacked basic feeling. He defended the uncredited components of traditional music artistry. His view was that traditional music was being mined for ideas by commercial music, and expressed concern that future generations would lose ‘the way’ in the economic, popular tumult. Thirty-nine other speakers ? almost all musicians and singers ? addressed the gathering, Cathal Goan (Teilifís na Gaeilge) chaired the final open session, and Tom Munnelly gave the closing address. Impromptu sessions of music followed debate; organised music for set dancing also featured, an exhibition of photography by Nutan accompanied the event, and over the weekend more than three hundred people took part. Ahern, Pat: ‘Fiche Bliain ag Fás. A Personal Account of 20 Years of Tradition and Change’, remarking on the explosion in the number of young people taking up traditional music ? many of them urban-based with no previous links with the tradition. Bazin, Fennella: ‘Lessons from One Hundred Years Ago.’ Examined two seminal collections of Manx music which were published 100 years ago, this in light of the developments which have taken place in the last twenty-five years. Bennett, Margaret: ‘From Kennedy Fraser to the Jimmy Shandrix’ Experience in Five Generations’. One of five generations of a music-making family, she looked at the process of transmission within it. Boyes, Georgina: ‘Unnatural Selection: Choice and Privileging in English Cultural Tradition’. Examined the ways in which specific types of singer and dancer, styles of performance etc. have been selected as suitable for display and transmission by organisations within the English Folk Revival. Burgess, Barry: ‘Irish Music in Education ? a Northern Ireland Perspective’. Viewed the issues which have influenced and restrained development of Irish traditional music in Northern Ireland education, including the two cultural identities, the Ní curriculum, media, broadcasting, etc. Carolan, Nicholas: ‘Irish Music to 1600: Traditions and Innovations’. Considered the evidence of innovation from before the sixteenth century using historical, literary and archaeological sources, and drawing on the music of analogous technologies and cultures. Corcoran, Seán: ‘Whatever happened to Horse-whatsit? Innovation and post-Colonialism in Irish Music’. Argued that the clamour for innovation is part of a post-colonial mind-set with parallels in other areas of Irish life, that it is the avant-garde of any period which always appears most dated in retrospect. Cranitch, Matt: ‘My mind will never be aisy’ is the name of a slip jig published in O’Neill’s Dance Music of Ireland, 1907. It has evolved to become a well-known slide in the present Sliabh Luachra repertoire and may also have had some influence on another slide. This example of metamorphosis illustrates the role played by Pádraig O’Keeffe (1887-1963) in the development of the Sliabh Luachra style of music. Though established at the ‘tradition’ end of the spectrum, he was also, in the truest sense of the word, an innovator in his music notation systems, repertoire and in versions of tunes. Curran, Catherine: ‘Changing Audiences for Traditional Music 1956?96’. Examined the changes taking place in Irish traditional music through the medium of the audience and their changing perceptions of Irish culture within Ireland and abroad. Dowling, Martin: ‘Communities, Place and the Traditions of Irish Dance Music Today’. Considered the present breakdown of regional isolation and of stable locality-based communities, the relationship between performer and music-community. Gaffney, Martin: ‘DO judge a book by its cover’. An audio-video presentation examining the evolution of cover-style in Irish music records from the céilí band era through to the 1990s. Gershen, Paulette: ‘Tradition, Innovation and Identity. Ethnomusicological Reflections’. Innovation, authenticity and modernisation explored from some of the theoretical perspectives current in American ethnomusicology. Hall, Reg: ‘Heydays are Short Lived ? Change in Music-making Practice in Rural Ireland 1850-1950’. Explored the social organisation of rural music-making in term of household, kinship and neighbours, community and trade; the shift from pre-famine, public space to private space in the late nineteenth century, back to public space in the 1930s. Hammond, William: ‘Traditional Music ? Whose Copyright?’ Looked at the relationship between traditional music, copyright and music rights in general, how this affects the musician on the ground. Hamilton, Colin: ‘Innovation, Conservatism, and the Aesthetics of Irish Traditional Music’ looked at the long standing attitude that the tradition needs protection from change, and must be ‘preserved’. Hannan, Robbie: ‘Tradition and Innovation in Uilleann Piping’. Questioned the belief that the uilleann piping tradition is rigid and unchanging, suggesting that the top pipers balance their commitment to tradition with their dynamism and innovation. Harbison, Janet: ‘Harpists, Harpers and Harpies’. The dilemma of the place and identity of the harp in Irish music-making. Hensey, Áine: ‘Michael Coleman’s brother was a better fiddle player’. Looked at the real and perceived influences of the media, using this and other examples to examine how the media can both distort and enhance. Hughes, Harry and Muiris Ó Róchain: ‘The Willie Clancy Summer School’. Dealt with the history of Ireland’s oldest and most popular summer school, which attracts more than 500 pupils from all over the world for its music classes alone. Moloney, Mick: ‘Acculturation, Assimilation and Revitalisation. Irish Music in Urban America 1960?96’. Looked at the dynamics of continuity and change in Irish music in America from 1960 onwards in the context of massive population displacement and social upheaval. Larson-Skye, Cathy: ‘Building Bridges ? Challenges in Playing, Performing, and Teaching Irish Traditional Music in the American South’. Examined the problems of teaching and playing Irish music away form the supportive Irish community and evaluated some possible solutions. Mac Aoidh, Caoimhín: ‘The Critical Role of Education in the Development of Traditional Music’. Argued that the foundation for progress in the development of traditional music lies in the provision of an educational infrastructure. Mac Góráin, Riobárd: ‘Media, Tradition and the Industry’. Gael-Linn and its operations world-wide since the 1950s, its successes and strengths. McLaughlin, Dermot: ‘Why Pay the Piper?’ Looked at the structure and financial relations between the state and traditional music and the support structures which are available in the public sector. Moulden, John: ‘Sing us a Folksong, Mouldy’. A personal perspective of the vocabulary of traditional music and song, considering some of the attitudes revealed in conversations. Munnelly, Tom: ‘Black Pudding and Bottles of Smoke’. Argued that the events such as the Crossroads Conference itself are part of a cyclical response ? in the long run their effects on the music are minimal. Ó Cinnéide, Barra: ‘The Riverdance Phenomenon’. Compared and contrasted the ‘artistic freedom’ experienced by the music since the establishment of CCÉ and the recent ‘liberation’ of dancing through Riverdance. O’Donovan, Joe: ‘Evolution and Innovation in 400 Years of Irish Dancing’. Outlined the history of Irish dancing, indicating the major influences resulting in change, and looked towards the future of Irish dance. O’Keeffe, Máire: ‘Tradition and Change in the Irish Button Accordion’. An overview of the way in which a new instrument is adopted into an already established musical tradition. Ó Laoire, Lillis: ‘Dearnad sa Bhrochán -Tradition and Change in Music in a Donegal Community’, the music and song of Tory Island, showing that change generated within this community was seen essentially as a force for improvement. Preston, Paschal: ‘When Old Technologies Were New: The adoption, diffusion and impacts of recorded music in Ireland’. Focused the period 1890?1940. Schiller, Rina: ‘Gender and Traditional Irish Music’. Investigated gender aspects of contemporary Irish traditional music performance, looking at concepts of female performance in comparison to those associated with Western art music. Smyth, Therese: ‘The challenge of bringing oral tradition of music into an academic teaching environment’. Discussed the problems of integrating oral traditions of music ? in particular Irish music ? into a university music programme. Sommers-Smyth, Sally: ‘The Founder Effect: a Model of Traditional Music Evolution’. Discussed the differing standards of performance in Ireland and America. Tansey, Seamus: ‘Irish Traditional Music ? the Melody of Ireland’s Soul’. Explored the place of traditional music in his home culture, its evolution from the environment, the land and the people. Topp-Fargion, Janet: ‘Continuity, Change and the Forging of New Identities’. With reference to the popular, urban music of South Africa and the Swahili Coast. Trew, Johanne: ‘Ethnicity and Identity: Music and Dance in the Ottawa Valley’. Discussed the way in which the Ottawa Valley ? settled by Irish, Scots and French-Canadians over the past 200 years ? developed and maintained its unique tradition and culture because of relative isolation. Uí Ógáin, Ríonach: ‘Camden Town go Ros a’ Mhíl ? Aspects of Change in the Connamara Song Tradition’. Examined recent development in the Connamara song tradition of a new type of song, how this has become part of the repertoire of Sean-nós. Wilkinson, Desi: ‘An Overview of Breton Traditional Dance Music’. Considered how social and musical influences have been brought to bear on the performance of dance music forms in Brittany. Pat Ahern, guitarist with the Four Star Trio, lecturer and weekly ‘folk’ columnist with the Cork Examiner. Fenella Bazin, an authority on the music of the Isle of Man in the period up to 1896, she researches the social history of Manx music. Margaret Bennett, a singer, is from a renowned family of traditional singers on the Isle of Skye, and is Research Fellow at Glasgow University. Georgina Boyes is a Research Associate at the Centre for English Cultural Tradition at Sheffield University; author of The Imagined Village. Deasún Breathnach, from Dublin, is a journalist, author, poet and musician. Barry Burgess, lecturer in Education at the University of Ulster, Coleraine, he has had a long term commitment to Irish music in the educational curriculum in Northern Ireland. Nicholas Carolan, director of the Irish Traditional Music Archive, lectures writes and broadcasts in the area of Irish traditional music. From Louth, he has presented the RTE programs The Irish Phonograph (radio) and Come West Along the Road (TV). His books include the Francis O’Neill biography A Harvest Saved. Barra Ó Cinnéide is Prof. of Marketing at University of Limerick, and is author of many case studies in Agri-business and tourism. Sean Corcoran, a native of Co. Louth, is a singer, bouzouki player, researcher and song collector and performs with the traditional group Cran. Matt Cranitch, fiddler and author of The Irish Fiddle Book, he is an authority on the music of Sliabh Luachra. Catherine Curran is a post doctoral researcher at DIT working on cultural and communications policy and the evolution of Irish music. Dr. Martin Dowling, fiddler and historian, is presently Traditional music officer with the Northern Ireland Arts Council. Martin Gaffney is a flute player and graphic designer. Reg Hall, musician and an authority on Irish music in England and Ireland; his PhD is on Irish Music in London. William Hammond, for several years director of the Cork Folk Festival, he has played a key role in set dancing in Cork. Robbie Hannan, uilleann piper, he is Curator of Musicology at the Ulster Folk Museum, Cultra, Co. Down. Janet Harbison, a harper, from Dublin, she is founder of the Harp Foundation and the Belfast Harp Orchestra. Áine Hensey, from Dublin, is a presenter of traditional music programs on RTE-Radio 1, Radio na Gaeltachta and formerly at Clare FM. Harry Hughes is an administrator and founding member of the Willie Clancy Summer School, and founder editor of the journal Dal gCais. Lillis Ó Laoire, Sean-nós singer, lectures in Irish at Limerick University where he is director of Ionad na Amhrán at the Irish World Music Centre. Cathy Larson Sky is a Traditional music writer and researcher, and fiddle player. Caomhín Mac Aodha, a fiddle player and teacher, he has been a key figure in the teaching of Donegal fiddle music, a founder member of Cairdeas na bhFhidléirí, and author of Between the Jigs and the Reels. Roibard Mac Goráin, Ceannasaí of Gael-Linn and Head of Gael-Linn Records and Distribution since its foundation. He has also been involved in their film making and theatre productions. Dermot McLoughlin, fiddle player, from Derry, he was the Arts Council’s Traditional music officer for many years and is currently its Artform director. Mick Moloney is a folklorist, musician, broadcaster, and lecturer in ethnomusicology, folklore and Irish Studies; a singer and guitar, Bouzouki and banjo player, he has many recordings. Robin Morton, from Co. Armagh, singer and writer, he was a founder member of Boys of the Lough group, a former director of the Edinburgh Folk Festival and runs Temple Records in Scotland. John Moulden is a former teacher, and well known as a singer, lecturer and researcher into Ulster songs, particularly the Sam Henry collection. Tom Munnelly is a folklore Collector with Dept. of Folklore UCD, a singer, and has published extensively on English language song in Ireland. Joe O’Donovan, step and set dancer, he is a major figure in the Irish dance scene, tutors at UCC, and is a member of the dance committee of CCÉ. Máire O’Keeffe, a fiddler, from Co. Tipperary, she is a former presenter of RTÉ’s traditional radio programme “The Long Note”, and is researching the accordion in Ireland. Muiris Ó Róchain, from Kerry, living in Clare, is the founding organiser of Scoil Samhradh Willie Clancy at Miltown Malbay. Paschal Preston is a senior lecturer in School of Communications in DCU, Dublin. Rina Schiller, an organologist and multi-instrumentalist; born in Berlin she lives and teaches in Belfast. Dr. Thérèse Smith is senior lecturer in music at University, College Dublin. Sally K. Sommers Smith, a fiddle player, she is Associate Professor of Biology at Boston University. Seamus Tansey, flute player and raconteur, originally from Gurteen Co. Sligo now living in Co. Armagh. Janet Topp Fargion, an ethnomusicologist, was born in South Africa, and is curator of the International Music Collection at the National Sound Archive in London. Johanne Trew, a researcher in Canadian music at UL, is Quebecois of Irish parentage. Ríonach Uí Ógáin is an archivist at the Dept. of Irish Folklore, UCD. Desi Wilkinson, a flute player and singer, plays with the group Cran and has completed a PhD thesis on Breton music. 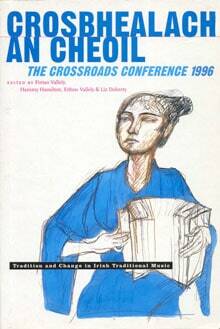 Croisbhealach an Cheoil (the Crossroads Conference) was the first ever conference called to debate the issues of ‘tradition’ and ‘change’ in the world of Irish traditional music. It was held at the Temple Bar Music Centre, Dublin over the weekend of 19?21 April, 1996, initiated by Cormac Breathnach and Fintan Vallely, and was planned and organised from the beginning by a committee which also included Liz Doherty, Hammy Hamilton and Eithne Vallely. Each of the organisers was outside of traditional music’s established organisational structures, all were musicians. The two major organisations of Traditional music – Na Píobairí Uilleann and Comhaltas Ceoltóirí Éireann (CCÉ) chose not to participate, the remarkable success of the event in such circumstances strongly indicating how independent and self-sustaining the music had become in forty five years of revival. The conference received the official patronage of Irish President Mary Robinson, and was supported by An Comhairle Ealaíon/The Arts Council; Arts Council of Northern Ireland; The Irish Music Rights Organisation; Music Departments in University College Dublin, National University of Ireland, Maynooth, University College Cork; School of Music, Trinity College Dublin; Irish World Music Centre at University of Limerick; Queen’s University Belfast, Dept. of Ethnomusicology; The British Council.